Benefit Improves skin clarity, texture, and color. Refines skin reduces wrinkles, Dark spots, and Pores. 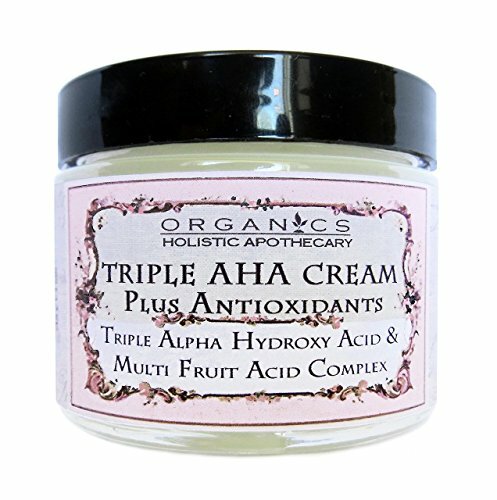 Benefit ORGANIC Natural Triple Alpha Hydroxy Acid & Multi-Fruit Acids Complex Face Cream Plus Antioxidants work together to leave skin moisturized. Benefit REFINES Complexion with Continued Use. Natural Alpha Hydroxy Acids.These AHAs have EXFOLIATING PROPERTIES, As they Exfoliate and leave the Skin with a MORE RADIANT APPEARANCE. Benefit Our NATURAL FORMULA Includes Lac­tic Acid (from Bilberry), Glycolic Acid (from Sugar Cane), Citric Acid (from Orange, Lemon, and Cranberry), and Malic and Tartaric Acids (from Sugar Maple) Plus Antioxidants which HELP PROTECT AND MAINTAIN Healthy Skin, COMBATING FREE RADICAL DAMAGE. Benefit Helps to FIRM AND REGENERATE the Skin thus lessening Fine Lines & Wrinkles. BenefitThis is a LUXURIOUS & LITE Face Cream that Absorbs into the skin. Has a clean light natural scent. OUR COMMITMENT: We do not use any Fillers or Binders, Artifical Dyes, Colors or Fragrances, Silicones or Dimethicones, Parabens, Sulfates or Phthalates. We are Cruelty-Free, Eco-Friendly. Made with Non-GMO Organic and or Natural Ingredients. This product is Vegan and Gluten Free. Our products are made daily with the Freshest Purest Ingredients delivered to your door to enjoy. If you have any questions about this product by HOLISTIC APOTHECARY ORGANICS, contact us by completing and submitting the form below. If you are looking for a specif part number, please include it with your message.